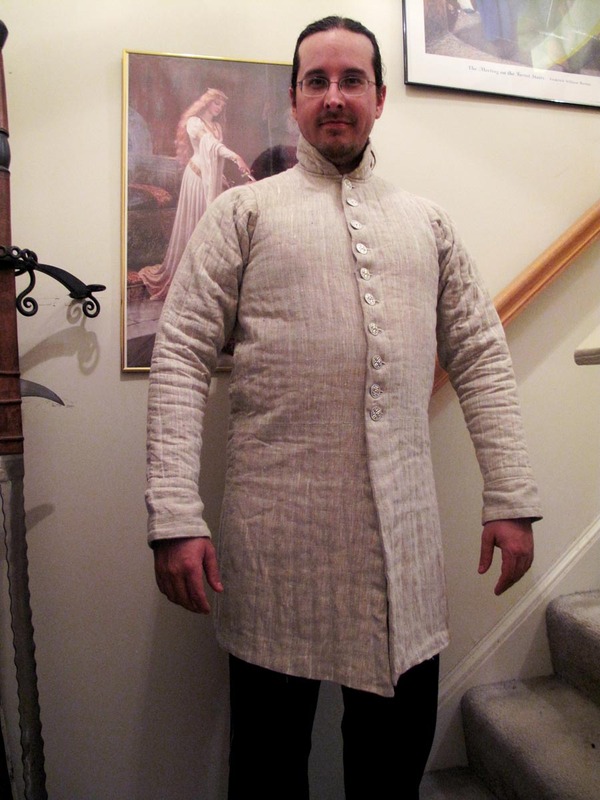 Do you gentlemen know of any manufacturers of custom tailored arming garments? My gambeson is enormous, but perhaps I could have it altered. Also, is there a good vendor for the chausses support rig that Sir Ian shows in his video? Revival Clothing has some arming garments, but they're not custom. Their sizing is a little inconsistent, in that you might where a large for one garment, and a small for another. Their arming cotte works pretty well. However you would probably need to both move and reinforce the arming points. I wear a Medium for this garment, so you might need a small since you're thinner. Their vest-like "pourpoint" is less historical but very functional. I often use both together since the pourpoint is tougher and I have an easier time tightening it around the waist. Historic Enterprises also has an arming doublet, but I don't have first-hand experience with that one. If Jessica hadn't closed her business, I'd have pointed you to Fuhlen Designs, since she did full custom work and had a clear understanding of how the garments are supposed to work, since she also fights in them. I'm not aware of anyone selling the lendeniers directly. I would love to see those catch on though. All my arming garments were self-made. Ed is correct that no vendor currently offers a quilted arming girdle for leg suspension. If you're still looking to do that 1250 Westminster Psalter, you don't want any of the Revival Clothing or Historic Enterprises garments, they're very much inappropriate for your time period. For a late 15th century harness through, you probably can't beat the Historic Enterprises doublet without going to a custom tailor who makes you a garment from scratch. 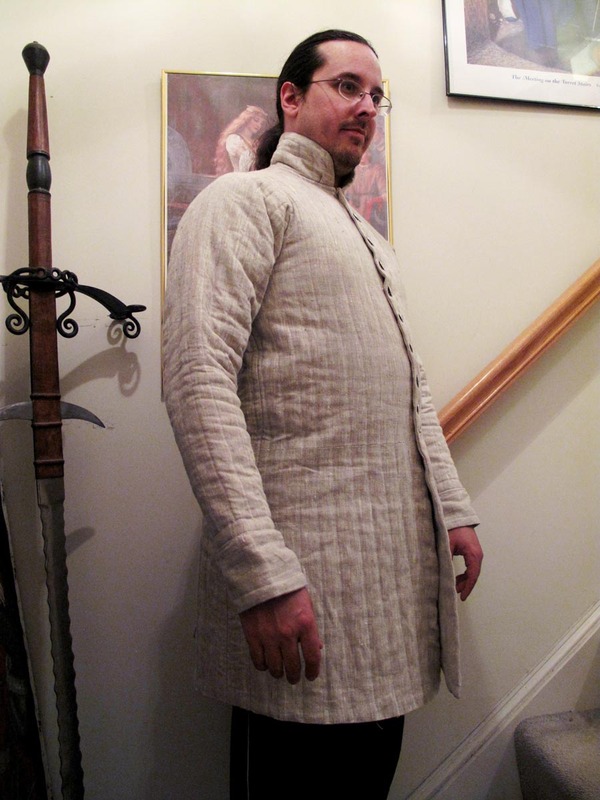 If you're looking for something with a more authentic look for 1250 you're interested in a quilted gambeson similar to this or this, with light to medium padding. When it comes to thickness, the thicker you go, the more the garment is a stand-alone padded armor less than it is a supplemental arming garment for a layer of mail over it. It will also become less mobile as you go thicker. So for wear under mail I wouldn't go too crazy on thickness or you'll end up like the stay puft marshmallow man. There are several Polish companies that make nicer gambesons than the off-the-rack stuff you can find in the US. Several of them also offer customization options like padding thickness or hand-quilting options. There is the option of buying a revival pourpoint and cutting it down to make a lendenier. I've seen it done. It's true, the ones I mention are based on much later designs, as Ian pointed out. They're for later plate kits and I was forgetting that you're targeting the psalter image. Sadly there isn't a whole lot out there for the 13th century and earlier, as an "off the rack" option around here. Gentlemen, thank you so much for your help. I perish the thought of how poorly equipped I'd be without your advice. One day, I hope to prove worthy of your companionship. On a similar note, what are your thoughts on "cheating" by choosing functionality over historical accuracy for things people won't see? It seems to me that if I can design a leg harness system which is better at its job than what was available in the 12th century and the device is hidden underneath other parts of the ensemble, why the heck not? For instance, I'm thinking of Jerry rigging a padding system/liner for my great helm. Acceptable or unknightly? That is entirely dependent on your goals. For me, I belong to a very strict Living History club that does shows around the DC area. Our goal is to do things "Right, or not at all." And to explain that I'll just steal directly from our website "The “Right” part is what we can document. The “Not At All” part means we would rather not see an object or procedure in our presentation if we don’t have supporting research for it." But our whole purpose as an organization is present the household of an English knight as accurately as we can portray for the education of the public. So anything else would be self-defeating. Personally, I find this approach to be very fun and rewarding. It's a ton of work and a lot of studying and researching, but it's very satisfying to pull off. Others may find this approach to be an utter waste of time and effort. Most people interested in the the Middle Ages aren't necessarily interested in doing strict living history though, and it doesn't make what they're doing any less 'right.' We're just playing different games. 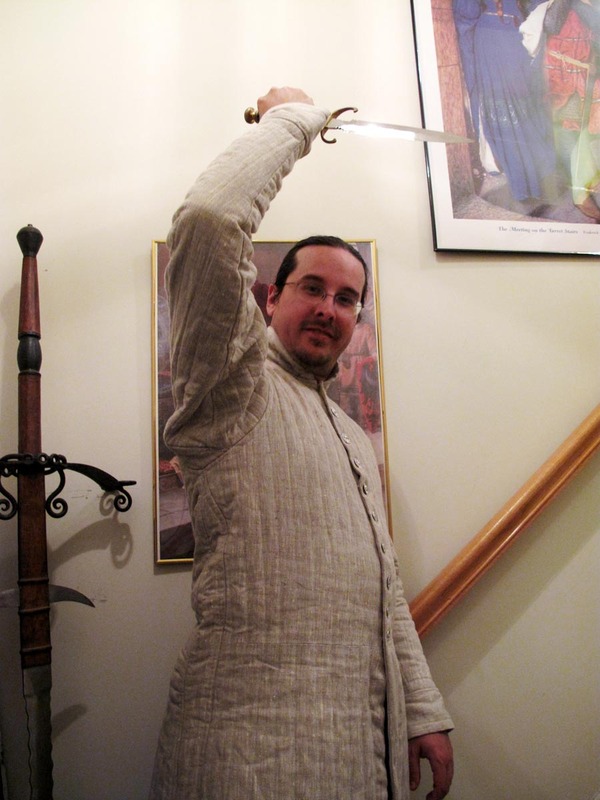 A lot of people here on the Modern Chivalry forums have as their primary interest the reconstruction of historical fighting arts, where historical fighting technique is the goal, so using modern equipment is perfectly acceptable, even in historical gear. It all just depends on which rabbit hole you want to go down. Some people want to go nuts, some people want to make a very good kit that looks great from the outside but makes compromises that aren't visible, some people prefer the "10 foot rule" (where it looks pretty good from 10 feet, but starts to break down upon closer inspection). All are acceptable approaches for our purposes here on Modern Chivalry, and no option is less honorable than another as long as you're intellectually honest about what your trying to achieve. All that being said, I think you may be pleasantly surprised to find out that when done with respect to historical accuracy, the real thing is quite functional, many times more so than modern attempts to fake it. ... and the device is hidden underneath other parts of the ensemble, why the heck not? For instance, I'm thinking of Jerry rigging a padding system/liner for my great helm. Acceptable or unknightly? Ian did a great job of answering this. I'll add that it might make you feel better to know that I have blue foam inside my great helm. It's my renfaire helm. I neither fight with it, nor use it for living history demonstrations, so I've treated it like a costume piece. Interestingly, the helmet I use for armored combat is not at all a historical helm, but it has historical inspiration for its design, and uses a historically inspired padded linen liner. This is an excellent point, and one that often gets overlooked. Our ancestors wouldn't have used something repeatedly, in life-and-death situations, if it didn't work. More often than not, if it's failing to function properly for us in modern re-creations, it's because we've done something wrong or overlooked an important detail, or it simply wasn't sized or fitted correctly. Sometimes the most common ways to "cheat" are arrived at by looking for cheap, or easy alternatives as historical enthusiasts, not expecting to live or die by what we've devised. For instance, the buttons on my gambeson I showed above-- That's entirely to make it quick and easy for me to get in and out of it. And it's machine-stitched, which saves time and effort. You've come to the right place for your questions. My only advice to you would be to heed what you've been told thus far. Sir Ian's response nailed it in one, I have nothing further to add other than- have FUN! If it isn't fun, you're doing it wrong. If it isn't fun, you're doing it wrong. There is one thing I will add- as far as custom garments go, its going to be bit of a crap shoot unless you're on hand to do multiple fittings and measurements as the job progresses; if your seamstress is not near you then this could slow things down. Sir Ian made his own and documented a pretty thorough process on how he did it- if I wasn't so lazy, I'd jump for it. Instead, I chose to throw money at someone else to do it for me- and it fits perfectly, but is only partially historic- no grand assiete sleeves, and cast steel buttons. But it does fit very well, and I was more or less surprised by that. I've used forgeofsvan for a couple of gambesons; they make for good wearing under harness and they do a good job with fitment but so far as I can tell, it isn't made to be historically accurate, more plausible than anything. It all depends on how much it means to you. I'd not go with them at the moment, it seems others are having trouble getting in contact with them. That was never my experience but times and people change.